All weddings are unique, which is the special thing about them, but the outdoor weddings at Garthmyl Hall are something really special. This summer I photographed the wedding of James and Jacqui Mackay at Garthmyl Hall in Montgomery, Powys. It’s a Grade II listed Georgian country house, in Wales, available for exclusive hire. And Jacqui and James are a couple who truly put their own stamp on the day, cramming it full of truly special, individual touches. 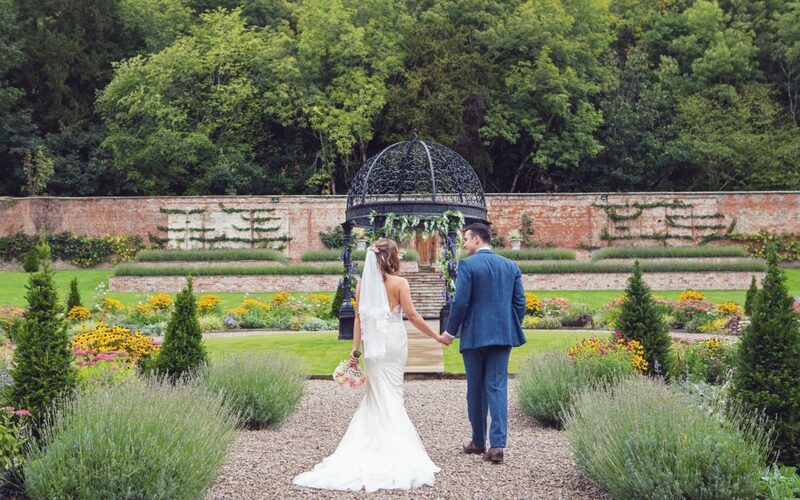 They had their ceremony indoors but much of the celebrations and photos took place outside in the stunning walled garden, which has been lovingly restored. It takes inspiration from the Secret Garden and the gardens at Aberglasney in Carmarthen and features a large wrought iron gazebo where couples can say ‘I do’ and stunning firepits to help guests enjoy evening celebrations al fresco. These, coupled with the stunning walls and flowers make for really stunning wedding photos. This couple is the real deal – meeting in high school when they were only 16! Their family homes are only 10 minutes away from each other and they got a pet tortoise to mark their engagement, which took place in New York on snowy 30 December 2016! Jacqui wore a beautiful dress by Rikki Dalal and the men’s suits were from Graham Browne. The bridesmaids looked equally gorgeous in dresses by Little Mistress. The bride’s make-up was done by Natalie Ricciardi and her hair was beautifully styled by Zori Jeffries. Florist Jane Phillips provided the flowers and bouquets and guests dined on the sumptuous food by Tallulah’s Catering. The evening entertainment was provided by WDC Entertainment with a DJ, GBFun bought a Casino and there was even a Trixipix Photobooth. The happy couple made sure there were plenty of unique aspects which represented them and ensured their guests were treated to a wonderful time. As well the beautiful dress worn by Jacqui, her mum also pulled out all the stops with an eye-catching wedding hat, which Jacqui said matched the cake! The couple wrote each other promises, which they exchanged in the morning (without seeing each other of course!) Harpist, Ceinwen Phillips played during the ceremony and canapes, their lovely grandma read a poem and their cousin sang, accompanied by a friend on guitar, at the ceremony. There was also a sparkler arch and a pimp your prosecco table! If you like any further information about Catherine Evans Wedding Photography, contact me here.